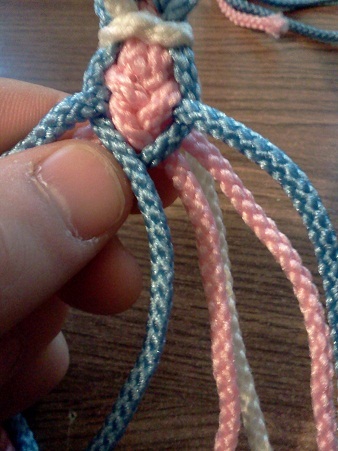 Hey, I just found this braiding style on the web. 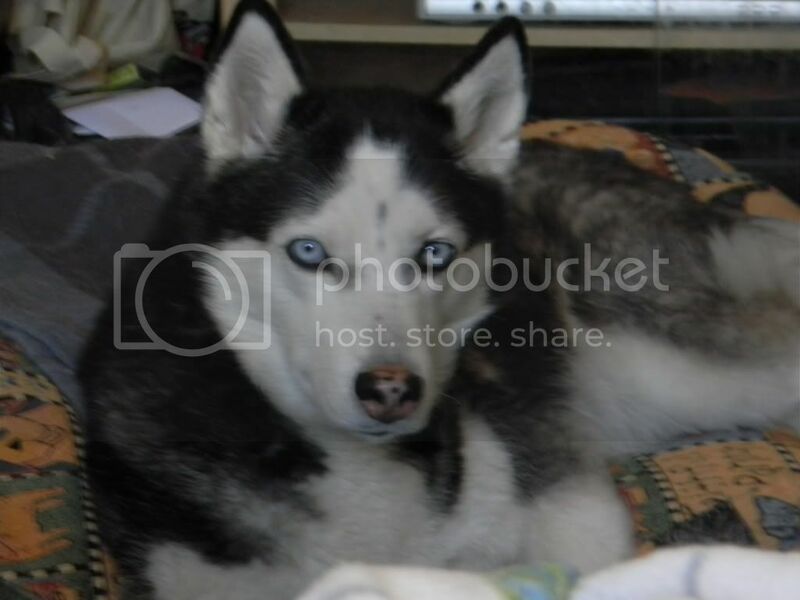 It is fairly easy to do and looks very nice. I haven't made a sling with it yet, but I'm about to. 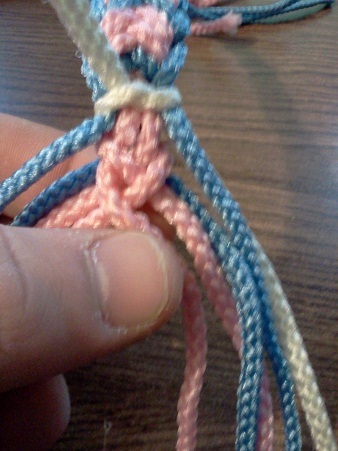 as a note, remember that for the purposes of making a sling you can modify this braid in order to created pouches, loops, etc. 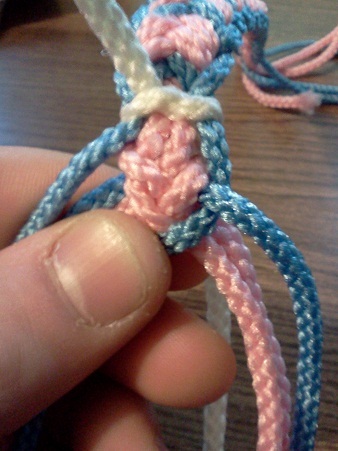 I see a lot of potential in this braid for making netted pouches. 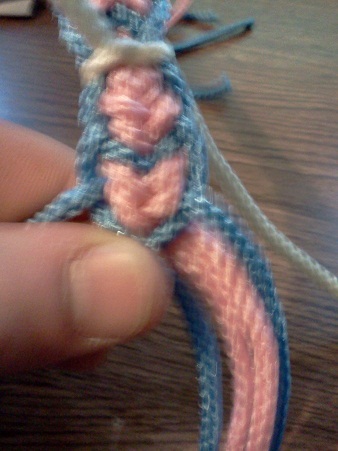 Also, this is the only flat braid that I've come across that doesn't twist up ( if you do it correctly). Another very important thing to note is that for this tutorial I have used strands of relatively the same size. 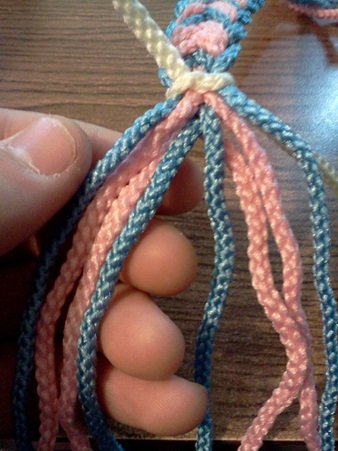 In the technically correct form of this braid, the two middle strands (pink in step 1) should be thicker than the two outer strands (blue in step 1). You can use doubled middle strands if you like. I personally think it looks fine the way I have done it here, but that is up to you. You should start off with eight strands, four on each 'side' of the braid. 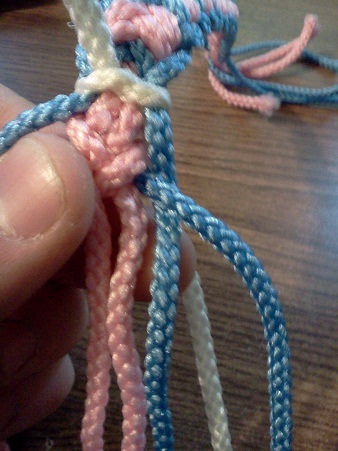 The middle two strands are colored pink and the outer two are colored blue for this tutorial. 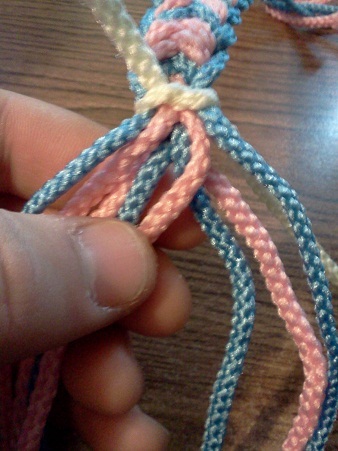 Also, I am using what I call a 'trainer' section of strings, as I use this relatively short section of cord to teach myself and others how to braid different styles. 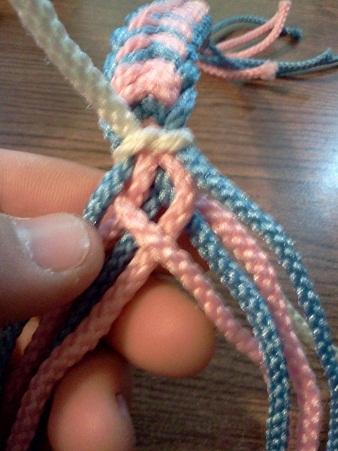 take the upper right side pink strand, or upper right middle strand (by upper right i mean the higher of the two middle strands on the right side of the braid) and bring it over the lower right middle and outer strands, so that it is below the lower outer left strand. take the new upper middle right strand and bring it over the new lower middle and outer right strands, placing it below the new lower outer right strand. take the upper outer right strand and bring it under the original lower outer right strand, now the new upper middle right strand, and then bring it across the new lower middle and outer right strands, placing it in the middle below the lower outer right strand. this step has two pictures for clarity of technique. 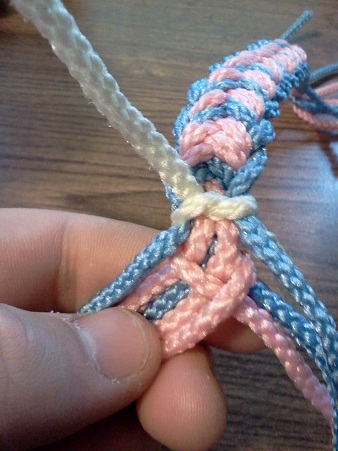 Essentially repeat step 6 with the upper outer left strand, placing it in the middle below the new lower outer right strand. Now repeat this cycle until you have reached the desired length. This pic is the latvian braid after two cycles. The latvian braid is my most favorite flat braid, as it doesn't twist up in longer braids as nearly all other flat braids are wont to do. 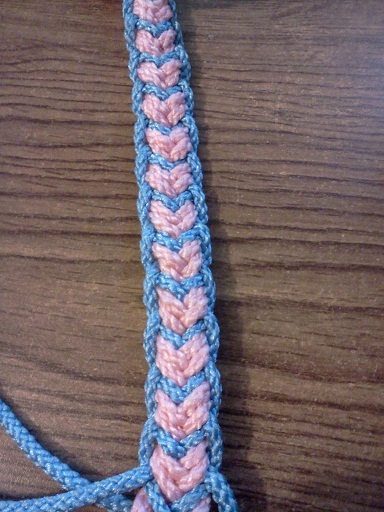 I've changed the name of this post from "check out this braid" to "Latvian Braid Tutorial"
That is a beautiful braid. My brain's wiring is damaged such that I never would have gotten it from the original tutorial that you posted the address to. Thank you for taking the time to do this tutorial. I'm going to try it. I included this in the Sling Making Tutorials section.